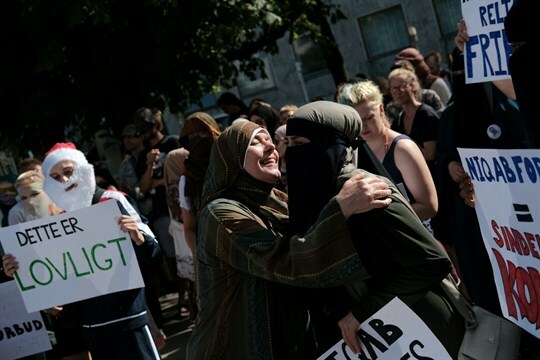 Thousands of people protest against the Danish government’s ban on the burqa and niqab, Aarhus, Denmark, Aug. 1, 2018 (Photo by Aleksander Klug for Sipa USA via AP Images). AARHUS, Denmark—To headmaster Karen Jessen, the school she runs embodies the best of Denmark. Sitting on the western edge of Aarhus, the country’s second-largest city, the school, known as Sødalskolen, or “Lake Valley School,” serves students from the ages of 6 to 16 from two starkly different neighborhoods. To the west of the school is Brabrand, a sprawling district of semi-detached and standalone homes belonging to a mostly white and affluent Danish population. And to the north is Gellerup, an area dominated by social housing in which up to 80 percent of the population are of non-Danish descent and incomes are significantly lower.